Before I had children, I knew about the downsides. I knew about the sleepless nights, the chaotic house, the picky eaters. But nobody told me about the bananas. You see, being a parent mean you always have old, tired, browning bananas in your fruit bowl. Every week I buy bananas at my children’s insistence – beautiful, even green bananas, and then the children eat all but three of them in about a day while I’m begging them to eat anything besides bananas, and then those last few bananas sit in the fruit bowl, quietly turning brown, and the kids won’t touch them. Being a parent means you need lots of recipes for banana bread. Banana bread is like gingerbread – I’m always looking for the perfect recipe. I love plain old banana bread, but I wanted to make one with a twist – that had an unexpected element that wasn’t the standard peanut butter or chocolate chips. That’s when I landed on sesame. There are a lot of Asian bakeries and sweet shops in my area, and one of my favorite flavors is black sesame. I wanted to incorporate the sesame flavor into something easy to make, but I also wanted it to be easy to make for everyone, which means using regular toasted sesame seeds (which are slightly less intense than black sesame seeds, but still have that nutty, savory flavor and great crunch) and a shortcut which is easy to find – tahini. I saw that Dominique Ansel – king of the cronut – had published a banana bread recipe that – unlike the recipes for everything else he makes – was super simple. 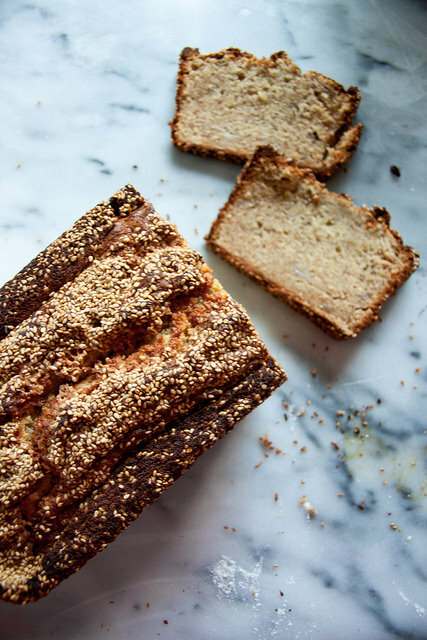 I adapted that one – cutting down the butter and sugar, adding sesame seeds and tahini and creating a great crunchy crust with raw sugar and more toasted sesame seeds. The result is a smooth, moist, sweet bread with some wonderful textural contrasts and a small, dense crumb. It’s a banana bread worth adding to your repertoire. As for me, I made this last weekend, and it disappeared by Tuesday. I might just make it again this weekend as I do have a jar of tahini, some toasted sesame seeds, and some bananas – a little too brown to eat. Preheat oven to 350 degrees. Prepare a 10x5 loaf pan by spraying it with baking spray or spreading with butter and then lining with the ½ cup sesame seeds. (I find it helpful to dump in the sesame seeds and then move them around the pan, letting them stick to the baking spray). Combine sugar, flour, baking soda, salt, baking powder and 2 Tablespoons sesame seeds in a bowl. In another bowl, mash the bananas (try using a pastry cutter!) and mix in the eggs. Add the egg mixture to the flour mixture and stir with a wooden spoon until just combined. Add the melted butter and the tahini, and stir until incorporated. Pour the batter into the prepared pan. Top with the remaining 2 T sesame seeds and the raw sugar. Bake for 60 to 70 minutes. Test for doneness by using a probe thermometer with the center of the bread reaching 190 to 200 degrees. If the top is getting too brown, cover with foil. Cool in the pan before slicing.